He began taking classes with the famous improv comedy group, “The Groundlings” in 1982. One year later, after being accepted into “The Sunday Company”, Jon got his first acting job on the television show “The Paper Chase: the Second Year”. Thinking he was on his way, he promptly quit his job at a clothing store…and became a messenger. The next three years – nothing!!! Then, in September of 1984, he was accepted into the main company at “The Groundlings”. Jon has been working non-stop since. He was nominated for an Emmy his first two years on “Saturday Night Live”. While on SNL, he became known for his characters “Tommy Flanagan of the Pathological Liars Anonymous” (“Year, that’s the ticket”), “Master Thespian”, “Hanukkah Harry”, and “the Devil”. He has appeared in numerous films, including “Big”, “A League of Their Own”, “The Wedding Singer”, “High School High”, “Small Time Crooks”, “Rat Race”, “The Producers”, “Eight Crazy Nights”, “The Benchwarmers”, and “Grown Ups 2”, among many others. He has also worked with acclaimed directors such as Penny Marshall, Rob Reiner, Jerry Zucker, and Woody Allen. For the last ten years Jon has pursued a career as a stand-up comedian. He is one of the few performers to start as an actor and then become a stand-up comedian who successfully headlines nightclubs, theatres, and casinos across the country. In 2015, Jon is set to appear in “Killing Hasselhoff”, “The Ridiculous 6”, and “Bark Ranger”, as well as headline numerous comedy shows across the country. One of the longest-running cast members in the 41-year history of SATURDAY NIGHT LIVE, versatile comedian Tim Meadows crafted some of the series’ most memorable characters during his 10 years on the popular late night show. 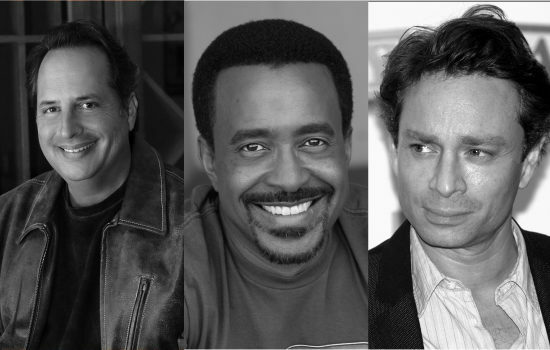 Such characters included Leon Phelps, The Ladies’ Man and Lionel Osbourne, host of the fictional public affairs show, Perspectives, as well as uncanny impressions of OJ Simpson, Ike Turner and Sammy Davis Jr. Meadows also played school principal in the hit comedy MEAN GIRLS and co-starred with Adam Sandler and Chris Rock in the blockbuster comedies GROWN UPS and GROWN UPS 2. Most recently Tim co-starred with Andy Samberg in POPSTAR: NEVER STOP NEVER STOPPING for Universal Pictures, and in the Fox hybrid live- action/animated comedy from Chris Miller and Phil Lord SON OF ZORN alongside fellow SNL alum Jason Sudeikis. He is a frequent recur on ABC’S hit comedy THE GOLDBERGS. Born in Highland Park, Mich., and raised in Detroit, Meadows studied television and radio broadcasting at Wayne State University before performing improvisational comedy at the Soup Kitchen Saloon. In 1985, Meadows relocated to Chicago, where he first joined Improv-Olympic, and then the legendary comedy troupe Second City. During his three- years at Second City, he wrote and starred in productions of The Gods Must Be Lazy, with Chris Farley; It Was Thirty Years Ago Today; and Flag Smoking Permitted in Lobby Only, gaining a loyal following with his sharp comedic talent. In 1991, Meadows achieved the dreams of comics nationwide when producer Lorne Michaels asked him to join SNL as a featured player. Nominated for an Emmy® as part of the show’s writing team that same month, he later made the transition to cast member status two years afterward. Several years after appearing in a string of films based on Saturday Night Live sketches, including CONEHEADS and WAYNE'S WORLD 2, Meadows was offered his own chance at features. The 2000 release of Paramount’s THE LADIES MAN gave the eponymous hero Leon Phelps the opportunity to bring his Courvoisier-drinking romantic adviser to the big screen. That same year, he left SNL to join NBC’s prime-time line-up as a regular cast member on THE MICHAEL RICHARDS SHOW, and in 2002, he joined the cast of the NBC sitcom LEAP OF FAITH. Meadows also co-starred in the Sony Pictures comedy WALK HARD: THE DEWEY COX STORY with John C. Reilly. Other films include JACK AND JILL, BENCHWARMERS, SEMI-PRO with Will Ferrell and ALIENS IN THE ATTIC with Kevin Nealon and Ashley Tisdale. He was series regular on THE BILL ENGVALL SHOW and GLORY DAZE on TBS and is a regular correspondent on THE LATE LATE SHOW WITH CRAIG FERGUSON on CBS and THE COLBERT REPORT on Comedy Central. Some of his other television credits include the NBC series MARRY ME starring as Casey Wilson’s father, THE OFFICE, THE NEW ADVENTURES OF OLD CHRISTINE and CURB YOUR ENTHUSIASM. Tim also lends his voice to animated hit comedies, THE LIFE & TIMES OF TIM and BOB’S BURGERS.